Hardscaping involves the non-organic elements of landscaping. Here we take a step back from the trees, shrubs, bushes, flowers, grass, and mulch of the landscape. In hardscaping we take an actual look at the shape of the land. Living in north Georgia, determines the fact that sometimes manmade elements are necessary for a functional and safe outdoor environment. In addition to adding function and structure for general everyday use, we also add hardscape elements for your outdoor enjoyment. In north Georgia we have seen homes that have been built where one would think a home couldn’t be built. If your home is located on the side of a hill, that can cause for quite a drop off in the backyard. In some cases, there may be a lack of a backyard. Other homes are built into the sides of hills on a slab and have nearly a vertical backyard. Imagine if the wall of behind to or next to your home came crashing down. The results could be disastrous. In both situations, a retaining wall is a near perfect solution. We have installed retaining walls to help people enjoy a backyard without feeling like they are going to fall off of a cliff the moment they step out the door, and we have built retaining walls to keep the earth in place for those that have a near vertical backyard. Whether your backyard is truncated to enjoy the view across the mountains with a near vertical drop-off, or if it is truncated and you are located in the heart of a hill, a retaining wall may be the perfect solution. 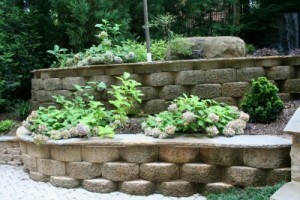 We offer free estimates to help with your retaining wall needs. Contact our Woodstock landscaping headquarters today.